Intrigua Convert Outlook Contacts allow user to convert multiple Outlook contacts to VCF format in one go. This bulk conversion saves precious time and effort of our users. A Clear or obvious user interface of convert Outlook contacts software help user to complete the conversion without any complication or intricacy i.e. anyone can perform conversion easily. Software allow to export contacts from any mail account associated with MS Outlook whether it is created default or added (outlook.com) to Outlook from Add Account Setup. Software allow user to export all Outlook contacts to vCard format and save them into any desired location or folder on your system according to the requirements. Convert Outlook Contacts Software support multiple or bulk conversion of outlook contacts to vCard by generating separate vCard file for each outlook contacts. That may be merged if required for importing to other mail clients. Export multiple contacts from Outlook to vCard including all attributes or details associated with contacts like photos, Full name, job title, different mail IDs, multiple phone number, complete residential address or official address etc. Where to Locate Outlook Contacts? Why to use Convert Outlook Contacts Software? Vcard file format is a standard way of saving user’s contacts on an email client & a phone device. And Intrigua’s Outlook Contacts to vCard converter supports the migration of Outlook Contacts to VCF file format. This tool has the capability to export Outlook contacts of any mail account and save them at desired location or folder according to the user’s choice. Moreover, the tool provides you the facility to export Outlook Contacts to Lotus notes and various another email clients. And supports all web based services like yahoo mail, Gmail, Hotmail, AOL mails etc. Step 1: Launch the Software and ensures that Export option is selected. 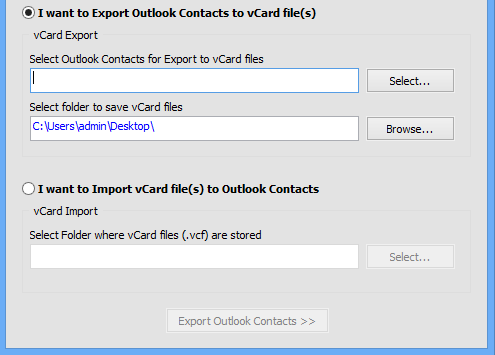 Step 2: Browse to select Outlook contacts and specify vCard saving location. Step 3: Click export Outlook contacts button in previous step to view summary. Step 4: Click on Export button to vCard button to begin conversion. Click on the following video tutorial that will guide our user how to convert multiple outlook contacts to vCard format. This initiative is taken by Intrigua software for the ease of our user to quickly comprehend the working of tool. Does convert Outlook contacts to vCard software runs on Windows 10? Yes. This Software can runs on Windows 10 without any complications. Convert Outlook Contacts Tool doesn't have compatibility issue with any Windows version. Do I need to have MS Outlook installed on my computer for converting Contacts to vCard ? Yes. It is necessary to have MS Outlook installed on your system for converting Outlook contacts to vCard format. Can I convert bulk or multiple amount of Outlook contacts? Yes. 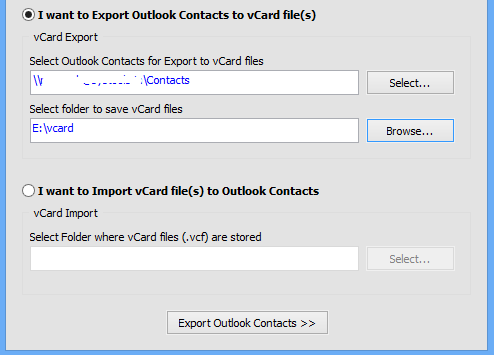 You can convert all, multiple, bulk Outlook contacts to vCard using this tools. Does this conversion preserves all detail information of contacts? Yes. All attribute or information's associated with contact is preserved by this tool after converting all contacts to vCard format. As per my experience, it is a incredible tool with very user friendly interface and helped me for converting all my Outlook contacts to vCard. I would really like to thank INTRIGUA Convert Outlook Contacts. It was never so easy to convert all contacts with details in vCard file; INTRIGUA Convert Outlook Contacts tool has changed my assumption about this conversion.